I just tried a 2018 AllStar 26 from a friend and there is no way I would ever again buy a board that make you stand so high above the water. I felt like a pig on a walking rope compared to my Bark Vapor. I am loking at the specs of the RS and it also look to put you very high on the water. For flat and chop I might just go back to my initial idea of a dugout like a Sunova Allwater. The RS doesn't sit as high Luc and it has more width forward near the nose so didn't feel nearly as corky or tippy. I personally prefer boards that allow a standing position closer to the water but I would have no problem paddling an RS , it felt great. I currently paddle a 2017 NSP Puma 14' x 24" and I love it because it's sits low and still has enough volume forward. Yes, the RS has quite a low deck position actually. You are no higher above the water than on your Vapor, and maybe even lower. The FX had a high standing position but users complained about that so it was clearly something that Mark addressed with the RS. And he got it just right IMO. Good compromise between dug out and a flat deck. And he got it just right IMO. Good compromise between dug out and a flat deck. Well, a big problem you might have with the used market is that I suspect that people will hold onto their RS boards once they've got them. As an all-round race/general paddling board its going to be hard to beat because it doesn't really have any glaring weaknesses. So it's going to be hard to find another all-rounder that will bring you something so much better than you will want to shell out for one. There comes a point, probably, where a person says "this is good enough for me; the rest is up to my body and my training". And I think this board might prompt that thought in a lot of the more seasoned racers, who are no longer fooled by the latest yearly marketing gimmicks. Yes I am afraid about that. That said, the Vapor in full carbon is a great board and I had two opportunities to buy one (one opportunity was enough :-) ) but to your point, now I am NOT selling it. Maybe somebody get lured by the Starboard 2018 1/2 or 2019 new model. I will also monitor demo and winter sales. I thought the Bayonet was made for lower winds and smaller bumps. The RS is an all-waters race board. 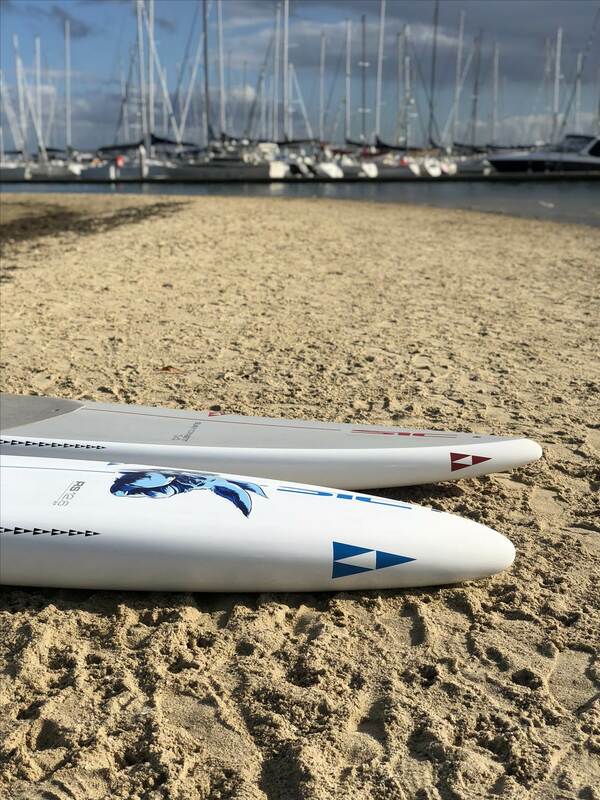 The Bayonet is a dedicated downwind board designed to work well even in small downwind conditions. The Bullet is a dedicated downwind board that shines in full-on downwind conditions. Many people would consider, I think, using the RS in no wind or very mild downwind conditions (eg. 10-20 knots), the Bayonet from about 15-30 knots, and a Bullet from 25-whatever knots. Many places in the world don't often get winds much over 15 knots. Whereas where I live we hardly ever get a day when it doesn't go above 15 knots at some point. You wouldn't use a Bayonet in a flat water race, but you could use an RS for sure. Slight wee segue, Area 10, have the new JL Sidewinders shown up in the UK yet? I'm curious how it will compare to the RS.. Both similar, but the JL has a Allstar sized concave.. Yes they are here. Hoping to try one soon. Yep had downwinded the RS the last couple of days. One day lower wind and had a blast. The 2nd day the wind go up higher than expected. Should have been on the Bayonet but was on the RS. Holy smoke that board is serious fun! But I agree with Area10 15-20knots I will take my RS anything more I will take the Bayonet. I already ordered a SIC Rs 12.6. I need a spec data : what is the nose thikness ? Could someone help me ? Thank you. Seems to be about 7.5"
So recently I went down to Hood River and tested boards from Bigwinds. Primarily compared the AS 14' 26" to the RS 14' 26". I wanted to buy the RS to complement my V2 but ended up purchasing the AS based on several hours of demoing on flat water as well as DW, side chop etc. btw, i'm 6'6", 215#. I thought the RS was very stable for my size (more so than the AS), very efficient on the flats and held a great line. On the river, it started out at 12ish knots then increases to over 20knots. The RS was surprisingly fairly good with the DW. I felt it tended to go in a straight line however and turning it was not fluid. The board looks to be fairly well constructed and noticeably lighter than the carbon AS. Given the lightness and feel, it didnt seem like it would hold up to the same punishment that the AS would. The AS was surprisingly fast on the flats. Garmin tested times were the same and slightly slower than the RS. It glides over the water very efficiently and holds a good line, but not quite as good as the RS. The AS does however have a very nice smooth flow from side to side, and this fluidity is really appreciated when planing in DW or DB scenarios. I found the AS to catch and accelerate easier and faster than the RS. I realize the RS isn't a DW board, but supping in my local lake is rarely flat and most of the time wind affected. The AS simply felt to be nearly as good on the flats and better in all other conditions. The construction seems to be definitely beefier, which is a bonus when your kids are climbing all over your boards. Thought I would give my impressions as I have enjoyed and benefited from many of yours. Every time I take this board out (RS 14'0 x 24.5) my love for it just grows. I'm now been mostly paddling on Dana Point like conditions and the board rips. Get's into every tiny bump early and surfs really well. You just have to put your back foot on the tail and you can surf almost any wave. Also I'm getting more confident going out through the surf and paddling against bigger waves than before. Now, my final test is for a good ocean downwind day. I've done a few downwinds in the winter on lakes and rivers (with nice bumps, but slower and smaller than on the ocean). Had a lot of fun and tried some different lines. Muito obrigado for the vid ! I'm so excited to get mine at the end of May. Hope I did the right choice. I'm 6'.0 for 209 lbs (doing actually a diet). I bought the 12.6x27 rs model with an good intermediate level. nice board Kretinou.did you have the option on 14ft length board? Wow, you have exceptional balance TJR paddling those skinny boards in that condition.